This entry was posted on November 14, 2018 by Magnattack. It is essential for pet food manufacturers to ensure their final product is free from physical hazards, including metal contamination, before it reaches supermarket shelves. Magnetic separators and metal detectors are two common and proven methods of removing metal from many food applications, including pet food. Metal detectors are required to detect any non-ferrous metals (such as stainless steel), whereas magnetic separators are required to capture and retain ferrous metals and tiny work-hardened stainless-steel fragments - especially those too small for metal detectors to detect. 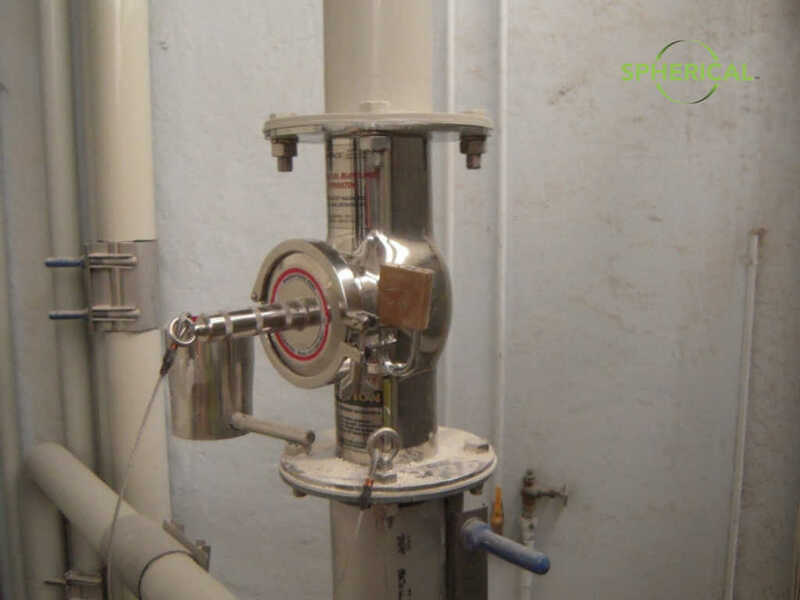 In this blog post, we outline where magnets and metal detectors should be installed in a typical pet food processing plant. 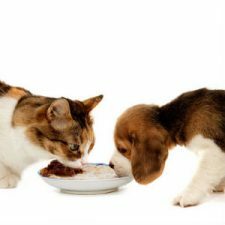 Ingredients for pet food products come from a variety of different suppliers - grain, cereals, meat, meat by-products and proteins, minerals, vitamins, and so on. These suppliers are also, to a certain extent, responsible for the safety of pet food. Most pet food companies inspect their incoming materials according to their company procedures and specifications, so it is in the suppliers best interest to provide a high-quality product if they want to retain their supply contract and sell their product at a higher price. For this reason, ingredients suppliers should also employ magnetic separators and/or metal detectors (depending on their product) prior to supply to pet food producers. Most dry ingredients will be transported from the truck/railcar via a pneumatic transfer line or bulk tipping. 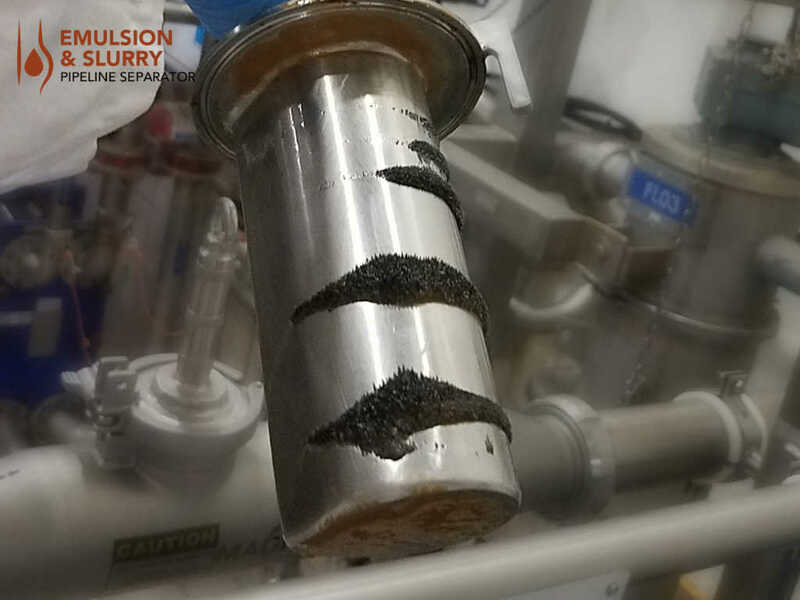 Initially, the ingredients should pass through a 'scalping' magnet, which will remove the bulk of the large fragments and contamination that may have entered during transportation and processing. The magnet of choice here is usually a self-cleaning grate type magnet or an inline pneumatic transfer magnet. RE80 Mag-Ram Automatic Self-Cleaning Magnet. 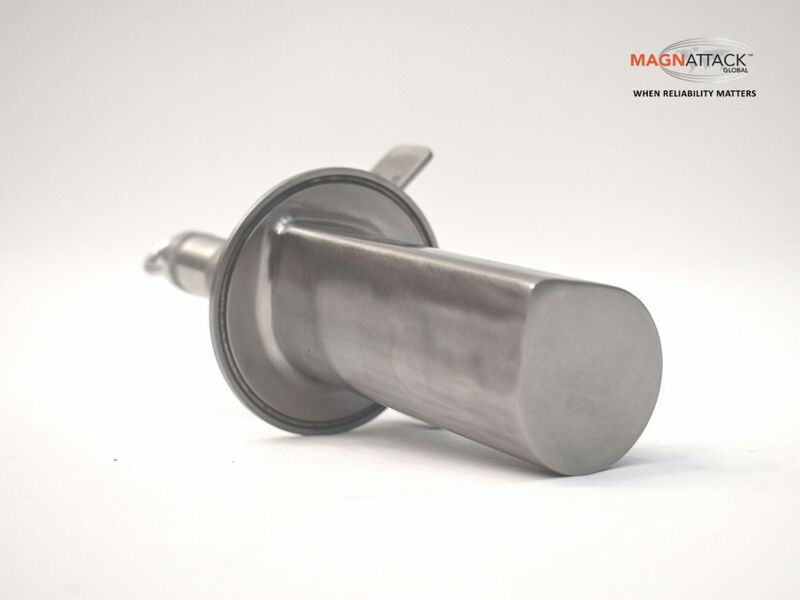 Magnattack RE80 Spherical Pneumatic Transfer Magnet. Meat ingredients typically arrive via a refrigerated truck. Suspension/Overbelt Magnets can be installed to remove the larger contaminants prior to hoggers or grinders. Plate Magnets remove the smaller contaminants. A high-intensity RE80 Round Nose Plate Magnet. Magnattack RE80 Dimple-Mag Plate Magnet. Wet ingredients are usually pumped into the plant from large tanks or drums. 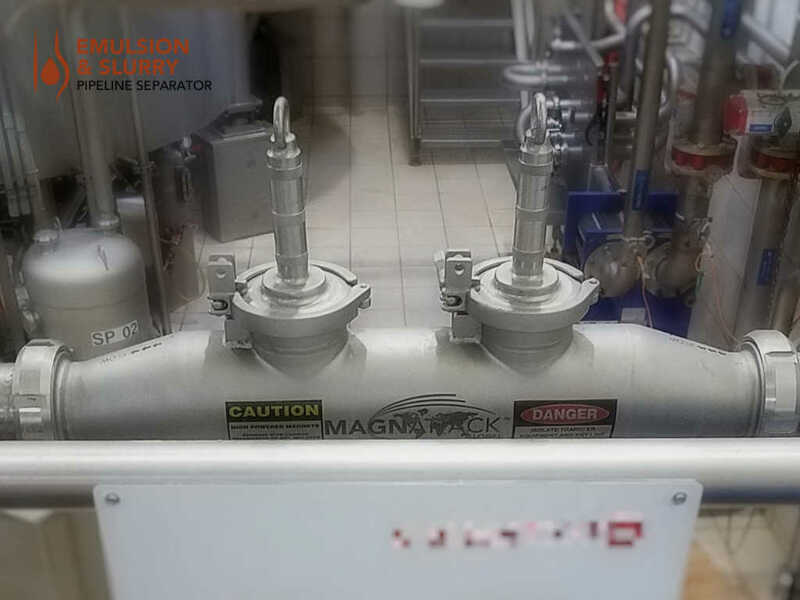 Inline Liquid Trap Magnets (also referred to as Finger Pot Magnets) are popular in these liquid applications, however, can present flow and hygiene difficulties. 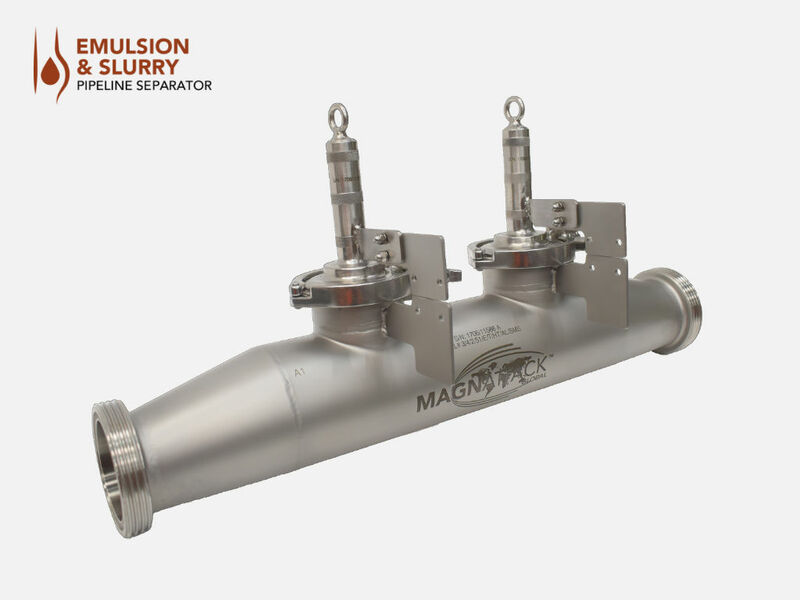 The new Emulsion & Slurry Pipeline Magnet effectively overcomes these difficulties and provides a more hydrodynamic, sanitary, and efficient means of separation. After the material has been unloaded from the transport, it can be stored in large silos or tanks until it is ready to be processed. A variety of magnets may be installed between storage and processing, depending on the product and how it is stored. It is important that contamination is removed before processing is begun to prevent damage to expensive equipment such as grinders and extruders. Such damage will subsequently lead to downtime and production loss whilst repair and maintenance activities are carried out. Multi-Finger Inline Liquid Trap Magnets can present many cleaning, hygiene, and flow difficulties. During processing (the grinding of meat and grain, the mixing of different ingredients, etc. ), operating equipment will inevitably experience wear and tear. This could range anywhere from a loose bolt or machine part that slips into the product or tiny dust-like shards of stainless-steel wear. Due to the work-hardening/mechanical fatiguing that these tiny fragments undergo, it is possible to extract and retain them using high-strength magnetic separators. Larger bolts or parts will need to be detected by a metal detector/x-ray machine as their size typically outweighs their magnetic susceptibility. Magnets in these applications need to be efficient, powerful, simple to clean, and designed to maximize coverage. In dry, high-tonnage, free-flowing applications, easy-clean grate magnets or, preferably, automatic self-cleaning grate magnets, are employed. For pneumatic lines, inline magnetic separators such as the Spherical Pneumatic Transfer Magnet or Round Pipe Separator are used. Magnattack Round Pipe Separator installed in a pet food processing plant. Spherical Pneumatic Transfer Control Magnet. In liquid applications such as slurries and meat emulsions, Liquid Trap Magnets, Inline Liquid Pressure Pipeline Separators, or Emulsion & Slurry Pipeline Separators are used. As mentioned earlier, conventional multi-finger Liquid Trap Magnets are popular, however, can present several difficulties to flow, hygiene, and separation efficiency. 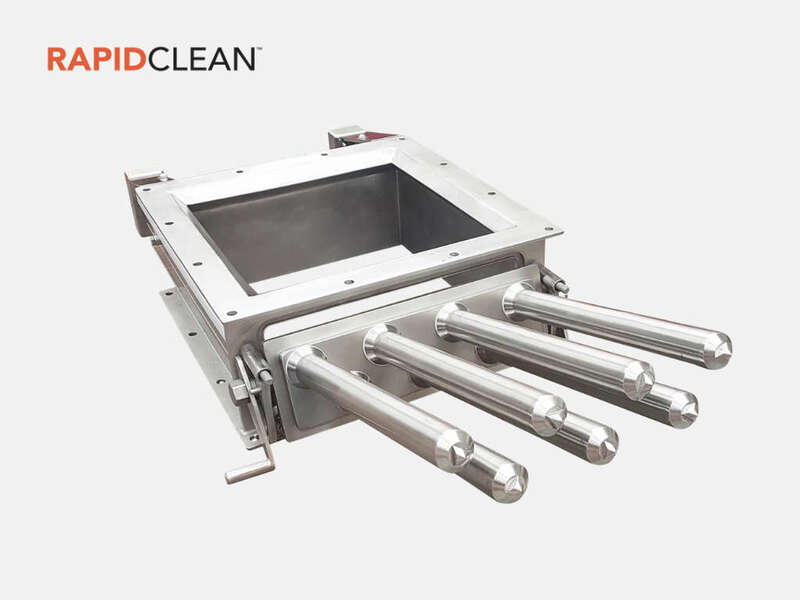 The Rapidclean Pot Magnet overcomes many of these difficulties, although RE80™ HT Liquid Pressure Pipeline Separators and Emulsion & Slurry Pipeline Separators offer a higher level of metal fragment control due to their more advanced design. They successfully overcome issues often experienced with bending and damage to bars due to the forces of pumped viscous products. 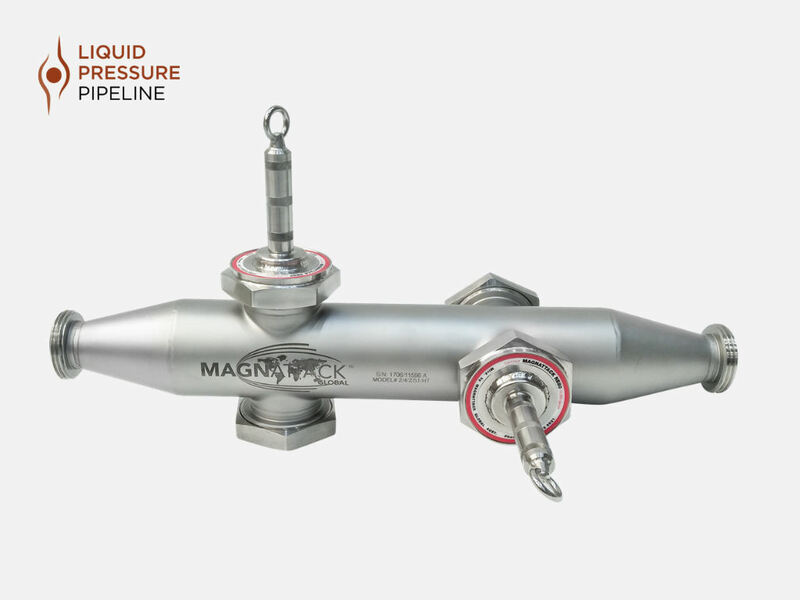 Magnattack Liquid Pressure Pipeline Separator. At this location, the role of magnetic separators and metal detectors is to ensure product safety and security. It is vital that contaminated product is not shipped to the customer as this can have devastating consequences - injury to pets, product recall, brand name damage, financial loss, and so on. As this is the final stage before packing, it is critical that metal fragment controls are of high-strength, adequate coverage, and compliant with current food industry standards regarding cleanability, cleaning method, and sanitary construction. Prior to bagging, dry product should pass through another set of grate magnets and a metal detector. 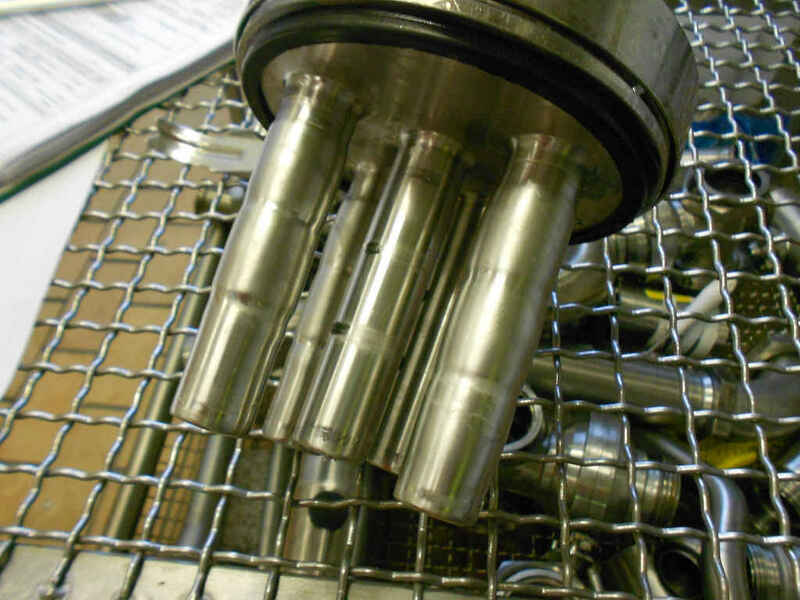 Installing sufficient metal fragment controls before the metal detectors will help reduce metal detector trips, product loss, and downtime required for locating contaminants. 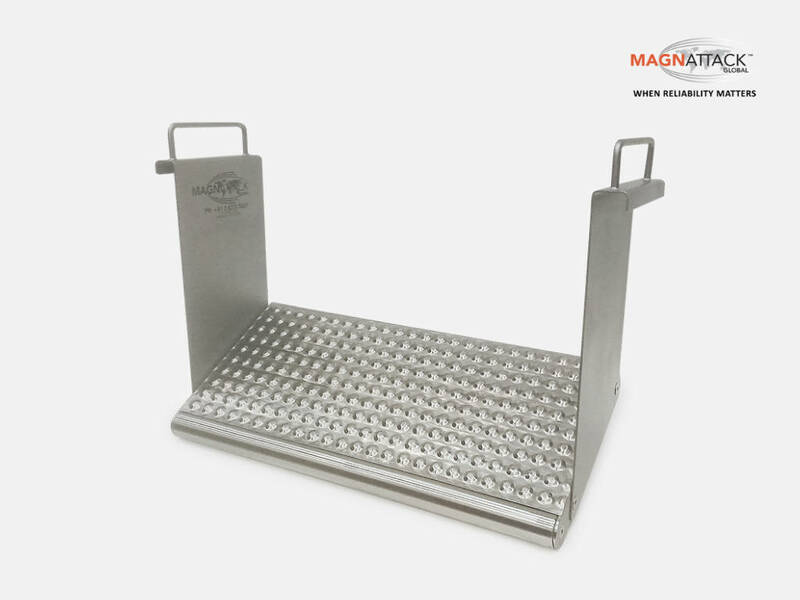 The Mag-Ram Self-Cleaning Grate Magnets are recommended as they provide continuous extraction of metal fragments and present a clean magnet to the flow at all times - thereby reducing risk of recontamination which may occur if the magnets are not regularly cleaned. 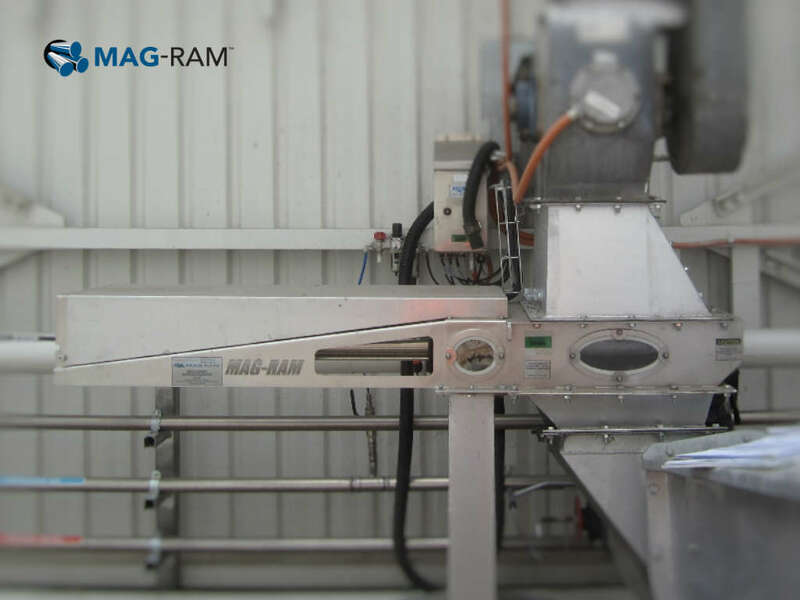 Mag-Ram Self Cleaning Separator installed in a pet food line. Prior to canning, wet pet foods should pass through a final set of magnets designed specifically for thick and viscous product. Special tear-drop probes are recommended due to their positive impact on the product flow and maximum product-to-magnet coverage. Their design also decreases the risk of recontamination by washing captured magnetics around to the back of the probe, which is out of the way of oncoming product which may dislodge the fragments and reintroduce them to the flow. 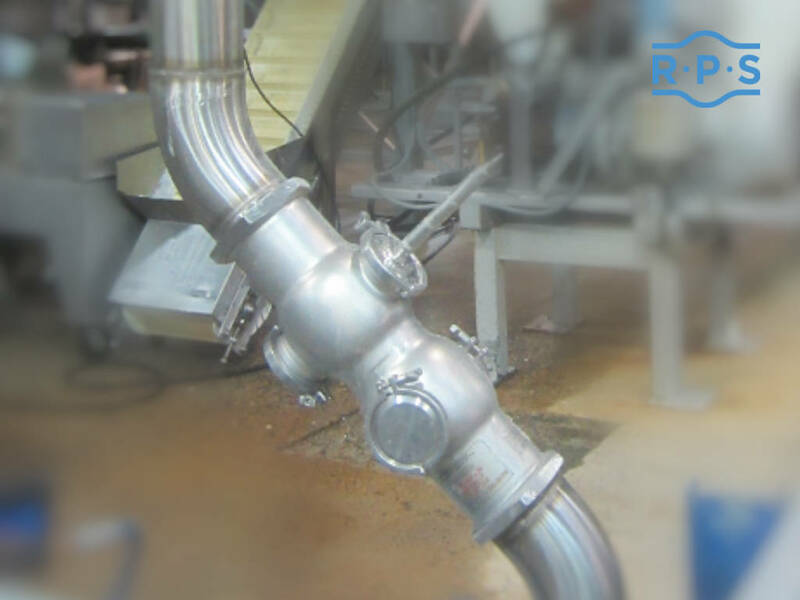 RE80HT Emulsion & Slurry Pipeline Separator installed in a pet food processing plant. 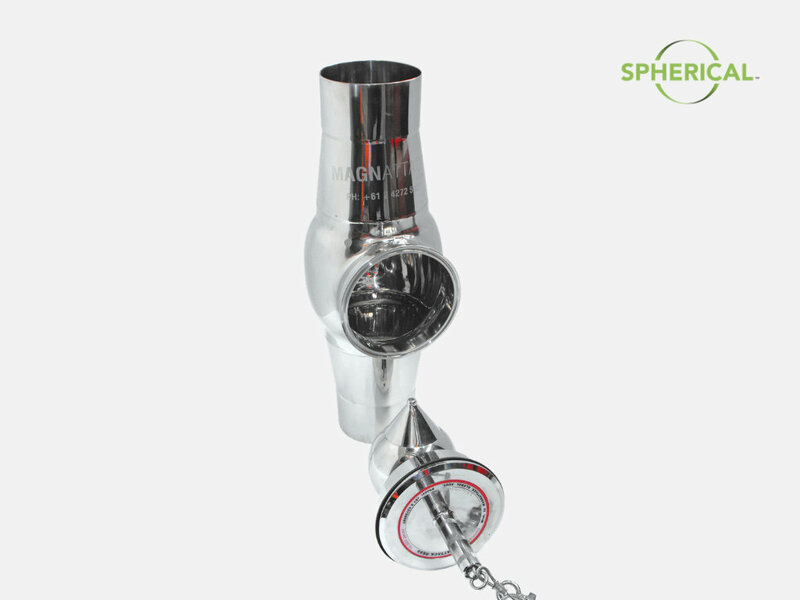 RE80HT Tear Drop Probe collects fine metal fragments from a viscous pet food slurry line. If sufficient metal fragment controls are installed throughout the plant, the risk of metal contamination in final product should be low, however, as a final precaution, the packaged product should pass through a metal detector before it leaves the facility. Protecting your pet food plant and product. Although the above information provides a general overview of where metal fragment controls should be utilized in a typical pet food plant, it is important to remember that no plant or product is the same. It is critical that each plant is analyzed on its own merits and a thorough risk assessment is carried out to ensure that maximum foreign metal fragment control is achieved. 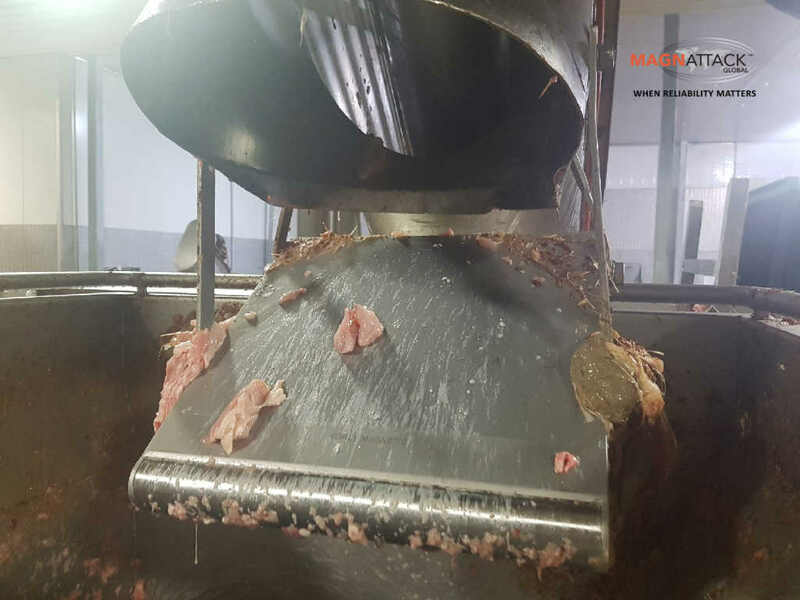 Magnattack technicians are well-trained and experienced in helping pet food processors achieve maximum foreign metal fragment control and product security. 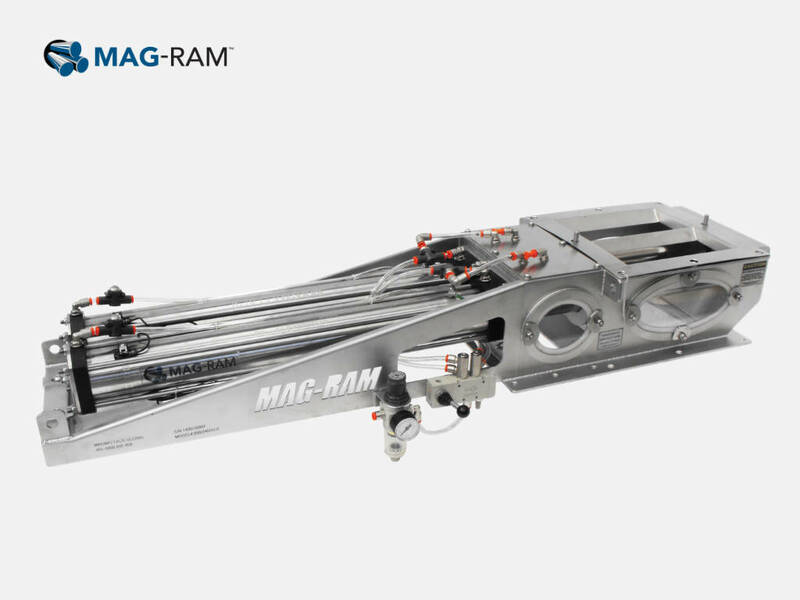 If you are concerned about metal contamination in your product and/or your existing magnetic separation equipment, please contact a Magnattack Global technician today. Love learning that these manufacturers are taking pet safety as seriously as other manufacturers are taking human safety when it comes to processing of food. So important!